I got another Idunn and finally my Arden build is complete, almost. Now I just need to plus him. I would like to change some skills, like his C-skill to, potentially, Odd/Even Def Wave 3, but it depends. Tell me if it’s a good build. That build looks insane. That’s awesome. Tbh, since you’re plusing him, might as well use Barrier Blade+ for even more mixed bulk shenanigans. I agree with @Mars124. Also give a res refine. After merging he will still have 52 def and 37 res when initiated upon. That is a really scary thought. And it would probably make it possible to maybe change his seal to a brazen or bond. 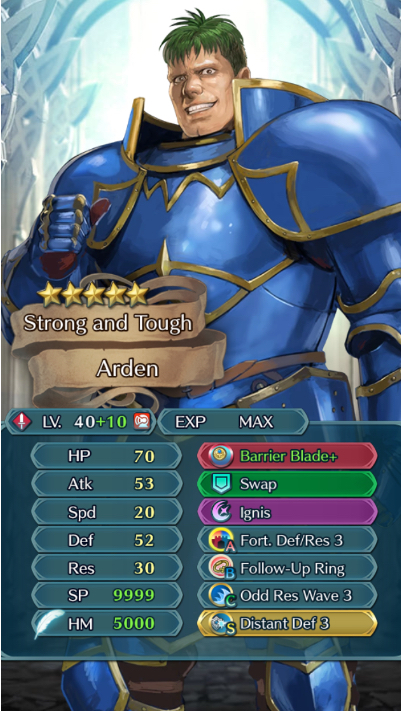 My Arden build would be so much more with Barrier Blade+, now that you mention it. Safeguard is good for now, but once I get Silvia and her weapon, Arden will be even better. Also, his Res would be really good after merges. Sorry, I put that up before I saw your post. I recently got a Silvia and instantly put her up to five star. Marisa killed her and took her sword. Nah, you’re good. 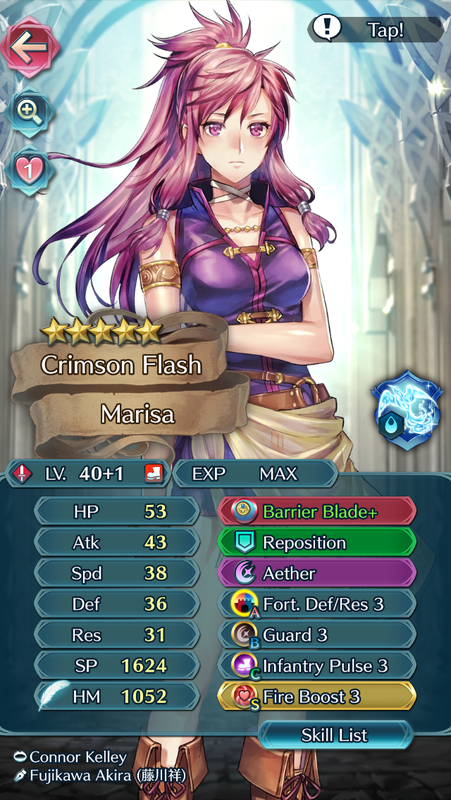 And I saw your Marisa build btw. Really cool, but I still don’t understand the boost skills. Aren’t they bad or just okay? 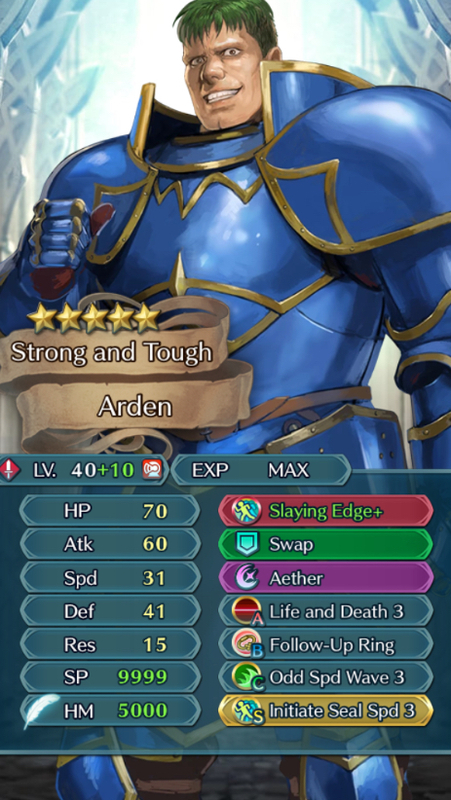 So, I made a build of what my Res focused Arden would look like +10, even if I never get him +10. The results? Oh. My. The boost skills in the right hands can be very good. 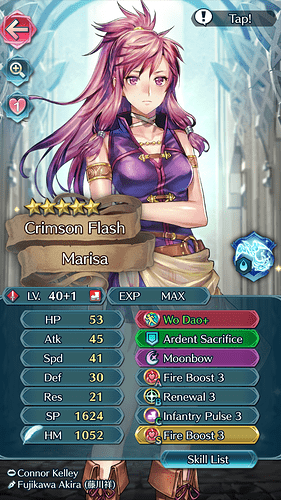 She used to run double fire boost and got clise to 60 atk due to her insane hp pool. Just have to have a way to heal to make it more reliable. For now it is a placeholder since I don’t know what I want in there. It’s either atk/spd bond, spd/res bond, or I’m gonna wait until atk/res bond is a seal. 49 Res is Arden’s Res with the buffs btw. That’s insane. And thanks for telling me what Fire Boost does. Yeah all boost skills give +6 to the stat they are related to as long as you have 3 more HP than your opponent. Anyone that is recommended to run panic ploy can run boost skills very well. Damn, minus 5 to def and it’s still 41. I love this. 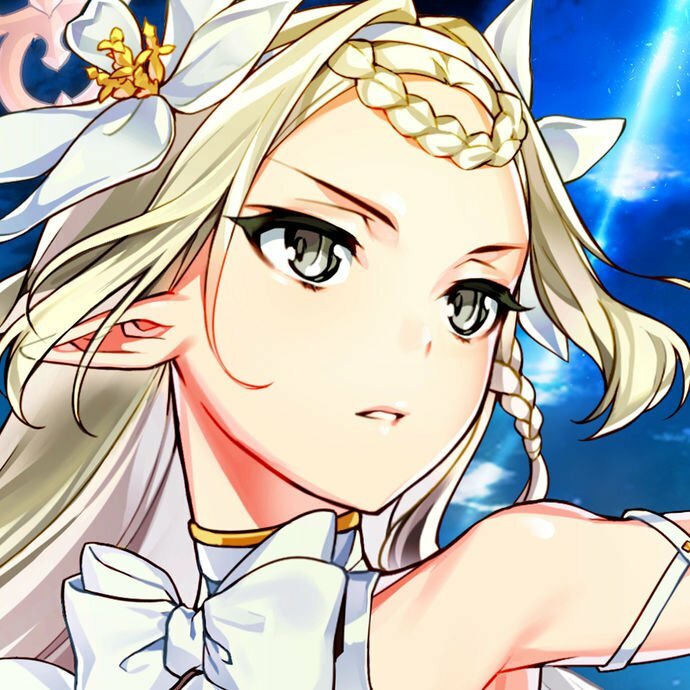 Boost skills are actually really good with some of the older units with really high HP. 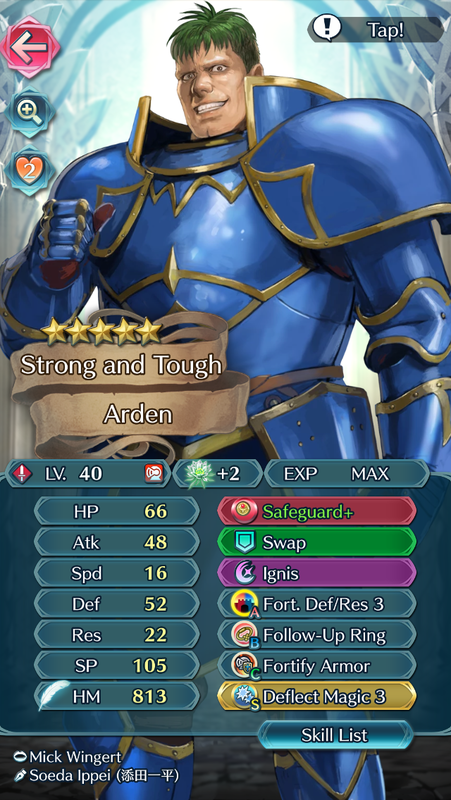 Double Water Boost Arden w/ Wo Dao/Noontime sustain was a thing I tried a long time ago that wasn’t too bad. Took on dragons like it was nobody’s bidnis. (Ok i’ll stop) Meme builds are fun. I really like boost skills. Marisa loved them when she was a pseudo healer. Now she is a enemy phase beast! Wouldn’t Steady Stance 4 be a better A skill for him? You trade 2 atk, 2 def and Guard for 6 res. He shouldn’t be fighting mages anyway, and if he does, delaying the special might give him better chances to survival.